Enforce the Constitution "provide" is a mandate, "promote" is a limitation. ObamaCare Supreme Court decision provides an opportunity to end civilization killers created by Federal provided welfare of Interstate Highways.. Enforce the Constitution "provide" is a mandate, "promote" is a limitation.. The Constitution mandates the Federal goverment "provide" defense. While, directly limiting Federal roll to "promote" welfare. Federal taxing of the people should be restricted to the needs of national defense. Taxing for welfare should be accomplished by the States, with the States contributing to the Federal government the funds the States determine is needed for the Federal government to "promote" the mission to providing welfare by the States and citizens. Article 10 of the Bill of Right is equally specific that the rights not specifically granted are retained by the States and the people. Federal providing welfare is specifically prohibited by the Constitution. Later in this article are specific quotes from Madison underscoring that his words in the Constitution were specifically chosen. Balancing the interests of the State to provide and Federal government to promote welfare would provide best services relative taxes. Section 1. Congress's direct taxation the shall be limited to providing for the common defense and funding Federal operations associated with defending liberty. Funds for Federal government promoting the general welfare shall be contributed by the several States. Section 2. Except in times of declared war, the budget must be balanced with sufficient reserves for periodically occurring disasters. Congressmen and Senators shall be ineligible for re-election if there is a Federal budget deficit for any two years except during declared war. Section 3. Federal government regulation of commerce requires a 2/3rds vote by both houses of Congress. To defend the Liberty of Posterity, except in times of declared war, the Federal government shall enforce usufruct, the capitalization of all costs so those benefiting from use, pay for that use, so resources are restored to like condition for use by Posterity. Section 4. Senators shall serve no more than fourteen consecutive years. Congressman shall server no more than eight consecutive years. Officer holder must wait three years between spans of Federal office. Section 5. To restore States as laboratories of democracy, reduce tyranny of the majority, and reduce the power of special interests Amendment XVII (17th Amendment) is repealed. Section 6. Robots are arms and may not be used by the Federal government against anyone in the United States without a 2/3rds vote by both houses of Congress. All laws governing the use of robots are to be clear, short and easily understood by the vast majority of Americans. To defend against robot attacks, all citizens practical will be receive 5 months of military training, be required to serve no more than 6 years in the militias of the States and may not be used by the Federal government except in times of declared war. Section 7. The Federal government is prohibited from engaging in foreign wars without a formal declaration of war for periods longer than 18 months, and forces greater than 400 people and costs greater 5% of defense spending. Section 8. The Federal government must not socialize costs that risk the liberty of Posterity. Section 9. The value of people's labor belongs primarily to them. Except in times of declared war, all governments in the US should spend no more than 10% of private economy. Section 10. The Federal government must back paper money with commodities. Albeit with good intent, Federal Government monopoly control of the means of production in power and transport infrastructures have created Civilization Killers of debt, Peak Oil, Climate Change and the Food Bubble. Oil was made the lifeblood of our economy. Oil is finite, so life based on oil is terminal. Even if oil exporters suddenly become politically stable, geology will force a 80% drop in affordable oil over the next 20 years. Risks of an 80% die-off can be preempted by self-reliance and free markets. 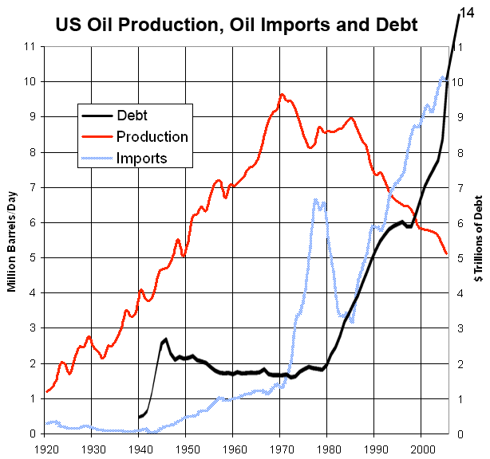 Mushrooming debt as unpaid costs of mandated oil imports were socialized by government. Loss of $13 trillion in American homeowners’ property values since 2005. Collapse of the banking system in 2008. Endless wars to protect access to oil. Since 1990, US military forces have been daily engaged in Iraq. “Do we use them? Oh, no! We burn up wood and coal, as renters burn up the front fence for fuel. We live like squatters, not as if we owned the property." Brutus: "It was because one part exercised fraud, oppression, and violence on the other, that men came together, and agreed that certain rules should be formed, to regulate the conduct of all, and the power of the whole community lodged in the hands of rulers to enforce an obedience to them. But rulers have the same propensities as other men; they are as likely to use the power with which they are vested for private purposes, and to the injury and oppression of those over whom they are placed, as individuals in a state of nature are to injure and oppress one another. It is therefore as proper that bounds should be set to their authority, as that government should have at first been instituted to restrain private injuries. This principle, which seems so evidently founded in the reason and nature of things, is confirmed by universal experience. Those who have governed, have been found in all ages ever active to enlarge their powers and abridge the public liberty." For the nobles, seeing they cannot withstand the people, begin to cry up the reputation of one of themselves, and they make him a prince, so that under his shadow they can give vent to their ambitions. He who obtains sovereignty by the assistance of the nobles maintains himself with more difficulty than he who comes to it by the aid of the people, because the former finds himself with many around him who consider themselves his equals, and because of this he can neither rule nor manage them to his liking. But he who reaches sovereignty by popular favour finds himself alone, and has none around him, or few, who are not prepared to obey him. Besides this, one cannot by fair dealing, and without injury to others, satisfy the nobles, but you can satisfy the people, for their object is more righteous than that of the nobles, the latter wishing to oppress, whilst the former only desire not to be oppressed. Government must be very limited with all powers not expressly granted being retained by the people. Government closer to the people is safer. Competition for taxing authority between the State governments and the Federal head may keep both from over-taxing the people. A Federal tax of 5% on imports should fairly well cover the Federal government's need for cash. Encroachment can be measured in that today people must give 100% of their earnings until April 18th to pay taxes. Workers must work 100% for the government until July 3rd to cover taxes and the 43 cents of every dollar the government borrows against its power to tax the people. Government is essential but cannot be trusted. The Constitution was adopted and within two years amended to include the Bill of Rights which specifically states in Amendment 10: "The powers not delegated to the United States by the Constitution, nor prohibited by it to the States, are reserved to the States respectively, or to the people." Section 1. The Articles of Confederation failed because some States failed to provide their quota of funds, risking the survival of the Nation during the Revolutionary War. Assuring the Federal head collects the funds to protect the nation is reasonable. Limiting the Federal government to only directly collect for the common defense will provide clarity into the proper use of those funds to accomplish that defense. States governments are closer and more in touch with the happiness of their citizens. Requiring the Federal head to tax State governments instead of people for funds to pay for Federal general welfare issues requires justification to the States that the Federal head is better able to meet social needs than government closer to the people. States are more accountable to the citizens and more capable than individual citizens of resisting Federal usurpation of the rights of the people. If a State fails to pay its share of requisitions for Federal programs that are dear to the people, the people can more easily replace the political leaders of the State without risks to the common defense. Splitting the power to directly tax the citizens better meets the Bill of Rights requirement that all powers not specifically enumerated in the Constitution to the Federal Government "are reserved to the States respectively, or to the people." Having the 50 States striving to save the lives of their citizens from Civilization Killers creates support for more alternatives and innovative economic lifeboats. The monolithic Federal approach is failing. Section 2. Requiring a balanced budget except in times of declared war will force caution in adventurous undeclared wars. The requirement for a reserve reduces the risks of debt sneaking in under the guise of surviving disasters. We know there will be recurring disasters, the government is responsible for preparing for them. Debt is a tax on future labor. Government debt that cannot be paid off within 30 years is a tax on children who cannot yet vote. Politicians convinced voters they should accept debt that indentures the liberty of their children for a Ponzi scheme, a transfer of wealth from young to old. At birth, the liberty and future labor of a child born in 2011 has declared debts of $46,000 and unfunded liabilities (hidden debt) of $1.2 million. A Constitutional Amendment is required to protect children from this taxation without representation. Rebellion or civil violence can be expected as children come of age and are forced to work to repay obligations they had no voice in creating. Section 3. Borrowing money against the labor of children via debt is noxious, but not as harmful as depleting natural resources they will need for survival. Far worse than debt is government socializing the cost of depleting natural resources instead of capitalizing those costs into the price of products so that those resources are restored to like use for our Posterity. Federal authority to regulate commerce has been used by interested parties to socialize costs to the many for the benefit of the few. The Clean Air and Water Acts began the process of de-socializing pollution costs. This Amendment requires the full capitalization of costs into product prices so that free markets can be more nimble in adjusting to changing situations. As a specific example, the cost of wars to defend oil supply chains are currently socialized. With this Amendment, all costs would be capitalized into the price of a gallon of gasoline. The people would vote for oil being essential to our national interests with their wallets every time they fill up a gas tank. A Personal Rapid Transit (PRT) network was built in Morgantown, WV as a solution to the 1973 Oil Embargo. That network has delivered 110 million oil-free, injury-free passenger-miles. Modern versions of PRT can provide urban mobility within a solar budget. PRT, like the Internet before 1984, cannot commercialize under a government transportation (roadway) monopoly. Life requires energy. Oil is finite, therefore nations and lives based on oil are finite. Before 1940 the United States operated mostly within a solar budget and Americans were self-reliant. Federal policy undermined that self-reliance, making oil the lifeblood of our economy. A nation dedicated to securing liberty to our selves and our Posterity fixed our future on a finite resource and made an addiction of it. Federal monopoly control over power and transport created oil's Potato Famine potential; a monolithic dependence on a source of energy 65% outside our control. Oil dependence resulted in the undeclared commitment of US military forces for 21 years in Iraq. Oil addiction payments funded the 9/11 terrorist attacks. Federal monopoly mandating oil-powered transport costs the lives of soldiers. The Order of Battle mandates the use of 22 gallons of oil products per soldier per day in Iraq and Afghanistan, yet 40% of deaths are associated with delivering oil products. Instead of adapting our Order of Battle, we accept casualties by mandating a car culture for which there are insufficient resources. Commercial networks are suppressed by Federal monopoly. Commercial freight railroad networks average over 423 ton-miles per gallon, yet since the 1950’s subsidies to highways caused the loss of thousands of miles of railroads. Federal Transit Authority has stifled free market expansion of Personal Rapid Transit (PRT) networks. Yet the PRT at Morgantown, WV has delivered 110 million injury-free, oil-free passenger miles since being built as a solution to the 1973 Oil Embargo. Defending oil supply lines are socialized in taxes and debt instead of capitalized into product costs. The cost of government bureaucracies, their people and the unfunded liabilities for employee pensions are socialized into taxes and debts instead of capitalized into the price of a gallon of gas and coal as would be required of a private business. Cost of pollution in health and environmental damage are socialized as costs to be paid by our Posterity. Depletion tax allowances encourage the rapid depletion of oil resources for the benefit of oil companies, socializing the deprivation that our Posterity will have to pay for, without the benefit of these resources. 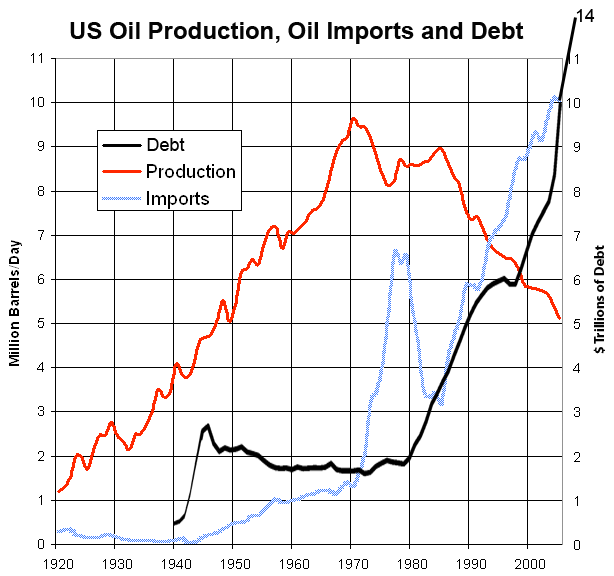 US domestic oil production peaked in 1970. World conventional crude oil production peaked in 2005 at 74 million barrels per day. Costs of depleting oil are socialized. Since Peak Oil in 2005, American home owners have lost $13 trillion in property value. Life requires energy. “Less affordable energy, less life,” is being socialized. National debt has increased in correlation with oil imports, socializing the cost to the people instead of capitalizing the true cost into a gallon of gas. The Federal monopoly will cause a Malthusian Collapse that seems likely to kill 8 of every 10 Americans over the next 20 years. Geology that has been understood since Dr. Hubbert presented the Peak Oil concept in 1956 and US domestic oil production peaked in 1970 will, at a slow and relentless pace, result in Americans losing about 90% of current access to affordable oil over the next 20 years. Yet the Federal monopolies used Stimulus money to build more roads, increasing the need for imported oil. Climate Change. We do not know exactly how climate works. We do know mass extinctions resulted from climate changes. Government monopolies in power and transport infrastructures have imposed the socialized costs of gambling onto the lives of our children. If costs to use fossil fuels were fully capitalized into product price, markets would adapt. Food Bubble. Government socialization of oil costs have created artificial markets for highly processed foods, shifted agriculture from family to collective farms (oddly Soviet-like) and created a 70 year bubble in the food supply. Obesity and population increases grew to fill this bubble that is now popping. Americans can assert our self-reliance by planting Victory Gardens. Peak Oil's Potato Famine potential, and other Civilization Killers, can be preempted by self-reliance. Section 4. Requiring breaks in service may help reduce risks of power entrenchments while not prohibiiting the nation from accessing the skills of unusually gifted political leaders. Periodic breaks to re-establish connection with citizens may improve the understanding of those seeking the power of high office. This concept came from the Anti-Federalist Papers. Institutions strive for consistency above all other objectives. Between 1950 and 2011 the people working for the Federal Government institutionalized oil as the lifeblood of our economy. Oil is finite, so life and a nation based on oil is finite. As an institution, they did not challenge their assumptions. Power was entrenched, not by wrong doers, but by good people clinging to what they know, not searching for what might be. As measured by the Civilization Killers, government monopolies and entrenched power have exceeded the restrictions in The Bill of Rights. An Amendment is required to specifically restrict government from using debt, socializing costs, monopolizing commerce and entrenching power. Civilization Killers created by the Federal Government must be mitigated and hopefully, preempted. "Vladimir Putin Calls US a 'Parasite' on World Economy"
"The Great Crash Ahead, Harry Dent"
"Can Anything Ease Pain at the Pump?" "Could Oil Prices Lead to Another Financial Crisis?"